Flyers captain Claude Giroux, the league’s No. 3 scorer, likes the makeup of the current team. MONTREAL – The Flyers trust whatever general manager Ron Hextall deems necessary before Monday's 3 p.m. trade deadline. After all, he's the architect of a team that is thisclose to first place in the Metropolitan Division, and he has built one of the NHL's best farm systems. That said, the players would be content if Hextall did little or nothing to a team that is 25-8-3 since Dec. 4, including its current 9-0-2 run, and has inched to within one point of first-place Washington. 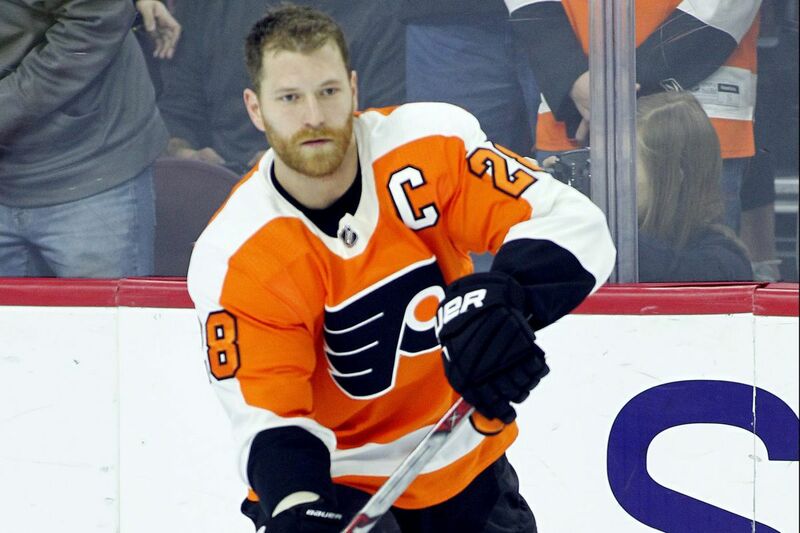 "We like our team," captain Claude Giroux said after the Flyers practiced at the Bell Centre on Sunday, preparing for Monday's game in Montreal. "We've pretty much had this team for two years and we like the way this team is headed. Whatever Hexy decides at the deadline – to make [a move] or not make any – that's his decision, but we like who we have in this room." The Flyers stuck together and didn't point fingers during their 10-game winless streak earlier in the season and, in a strange way, it strengthened their bond. "We've been doing a good job of playing as a team and sticking together, especially when you lose 10 in a row and you see the true colors of players – and we didn't see any negative things in this group," said Giroux, who entered Sunday as the NHL's No. 3 scorer with 74 points. "It's definitely a positive." "If you look at where we're at, we're positioned pretty well," said defenseman Andrew MacDonald, one of the team's alternate captains. "We have a great group of guys in here. Great chemistry. Everyone has bought in and we're all playing the right way. Obviously, we're confident now and we're going to be confident at 3 o'clock [Monday]." As the trade deadline approaches, Dave Hakstol, who has become a coach-of-the-year candidate, says his main concern is getting his team to keep improving. "If there's a move or some type of decision that has to be made that Hex feels will make us better, I'm sure he'll look at that in every way," Hakstol said. "But our job is to take care of our own business inside this dressing room and continue to work to win games, continue to work to find ways to improve the things we're doing here." The Bruins, the only team in the NHL with more points than the Flyers since Dec. 4, were among the busiest teams Sunday. They put together a costly package to acquire New York Rangers left winger Rick Nash, who turns 34 in June and can be an unrestricted free agent this summer. Boston also signed veteran forward Brian Gionta. Flyers left winger Oskar Lindblom has yet to score a goal in his three games since being promoted from the Phantoms. But he has looked impressive playing parts of the last two games on an effective line with Nolan Patrick and Jake Voracek. If the Flyers don't make a deal for a winger — Ottawa's Mike Hoffman, Buffalo's Evander Kane, and Vancouver's Thomas Vanek are among the veterans who are available — they will probably count on Lindblom to hold his own down the stretch. "Every game he's getting better; he just feels a little more comfortable," Giroux said. "He's a smart player," said Voracek, who has been on Lindblom's line the last four-plus periods. "Big, strong. He makes the right decisions 90 percent of the time, which is a pretty good percentage. He wins a lot of board battles, which is important to keep the puck in the offensive zone, and in the defensive zone, as well, he can get the puck out of the zone and kind of create something on the rush." As for a potential trade, Voracek said, "I think we're lucky that we have a patient GM. He doesn't make desperate moves … especially when you're winning. It makes you feel more comfortable." The Flyers put defenseman Mark Alt and Phantoms goalie John Muse on waivers. Both should clear. In a paper move, Alt (and possibly Lindblom) could be sent to Phantoms Monday to become eligible for the AHL playoffs. (Alt could actually be sent down if the Flyers add a veteran defenseman.) Muse, who has played extremely well, is expected to get a two-way deal so Flyers can recall him if necessary. … Ottawa put 6-foot, 195-pound defenseman Johnny Oduya on waivers, and he could interest the Flyers as a depth defenseman. They also could be interested in 6-1, 219-pound Ottawa defenseman Ian Cole, who was just acquired from Pittsburgh. … Hakstol said the limited remaining practice days – such as Wednesday in Voorhees – are important to "work on little things" and keep getting better.